Fitzroy Terrace is a Georgian terrace row, built in Redfern, Sydney c1845. It consists of seven separate terraces and is a state heritage item. While the front of the terrace row remains largely intact, the rear of the terrace row has seen varying degrees of adaptation, extension and reconfiguration. The cottages, designed by architect/builder James Hume, were originally built to house the colony’s emerging middle class professionals. Over ensuing decades the fortunes of inner-city Redfern declined and the houses were seriously neglected. The re-gentrification of Redfern has led to renewed interest and the return of a similar tenant base. In the case of this particular terrace, when the owner purchased the property the front rooms were substantially intact, although in a very poor condition. The rear had very little original fabric remaining, consisting of the old scullery, a separate outhouse and the remnants of at least five subsequent renovations. 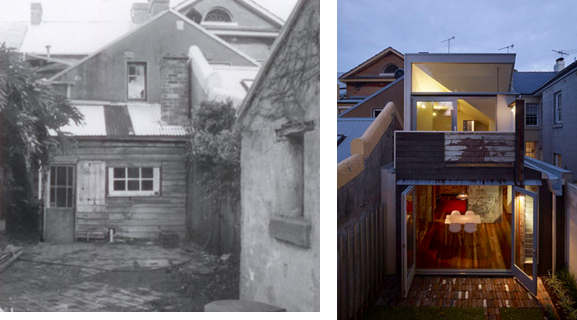 At the beginning of the renovation the owners worked with a heritage architect; however they felt that the first scheme, while complaint, was too constrained. In the end they looked to Welsh & Major to create a family home that respected the old without compromising on modern living. 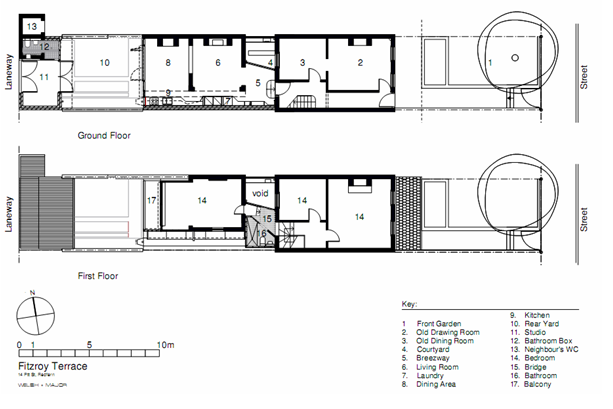 The basic floor plan had been established over time by previous architects. The introduction of plumbing, and other developments since the first build, has meant that over the years the floor-plan has become quite haphazard. The main front four rooms of the terrace, were serviced by 2 separate buildings to the rear; a kitchen/scullery with a loft/store above and an outhouse. The kitchen/scullery had been linked to the main terrace sometime around 1890-1900, firstly by a single level laundry, then later by an upper level bridge. In the early-mid 20th Century the breezeway that existed between the two rear buildings was enclosed, leaving the rear lower room of the front part of the terrace isolated from natural light. Often the difficult part of a restoration is to work out which layers need to be kept. Each additional renovation forms part of the journey and the historical significance of the house. The decision was made to remove the laundry in order to bring light down into the centre of the building and to the back of the front section. The bridge was retained because of its “kooky” character and history. 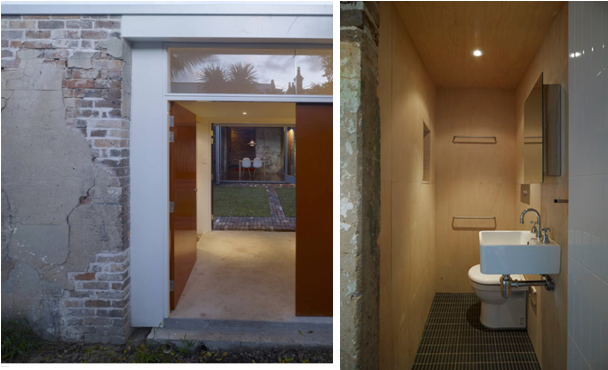 It was adapted to fit a small bathroom in the outhouse and the existing bedroom was enlarged. The most modern addition is the butterfly roof, which was used to create airy bedrooms on the top floor. Skylights along the edge of the property bring light into the first floor. A new kitchen was inserted on the boundary wall at the rear section, it has been separated from the original building by a skylight that draws light from above and separates the old from the new. The kitchen is angled to allow walking access around the old building. The shell of the old outhouse on the rear boundary houses a new bathroom and a new studio roof extends across the width of the property to create separate self-contained accommodation. The space between the two buildings has been converted into a landscaped courtyard. 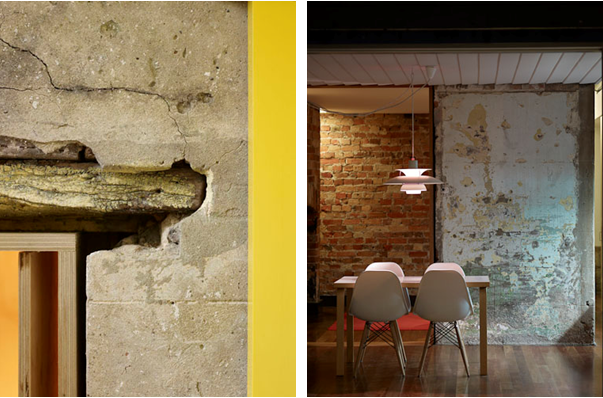 The aim of the re-build was to distinguish between old and new fabric and to recycle old materials as much as possible. Where a new opening was made the brickwork was simply cut and left exposed. Original door jambs were lined in timber. Ashlar render is left so the extent of the original buildings is still discernable. No new materials were introduced, old materials were reused where possible and left in their “as found” state or given a coat of oil. Timber boards covering the rear facade are clearly original but have been used as cladding in a contemporary way. Bricks from the demolition were reused in new garden walls and paving. New timber is painted in colours referenced from the original building fabric such as aubergine, light ochre and olive greens and reds from aggregates in the exposed brickwork. Missing sections of original details such as balustrades, windows and thresholds have been replaced with respectful, clearly different adaptations of the originals. Welsh & Major won the prestigious State Heritage Greenway award for young architecture practice for this design in 2009. Domestic houses are rarely the recipient of this medal however jurors recognised the creative and innovative approach to the heritage fabric. From the starting point the architects chose to reuse as much as the existing fabric as possible recognising that “the textures and colours of the existing house were rich and complex – 150 years of life were imbued in its materials”. Everything that was removed from the old house and was salvageable was set aside. When demolition was complete, we were able to reassess the design. While the overall building form did not change, components of the building were reconsidered and their materials altered. Building continued and amendments to the approval were sought to accommodate the material changes to the design. Despite the fact that the house was in a dilapidated state, they managed to achieve their desired outcome with what they have described as a ‘loose-fit design’ to create a flexibly home suitable for a contemporary lifestyle. As owners of State heritage listed properties owners must be aware of their role of custodians of our most important buildings. Listing permits sympathetic development of heritage places through an approvals process. The process to gain approval ensures changes retain the significance of heritage places. State listing normally prevents demolition and neglected maintenance. NSW listings do not otherwise prescribe how a place can or cannot be changed. Any change to a listed place can be assessed for approval. Heritage buildings are best cared for when they are lived in and loved, but this means they must be useable. Listing does not exclude changes or additions or new buildings on the site provided that these do not detract from the heritage significance of the listed items. This is consistent with what most owners want for their heritage properties.